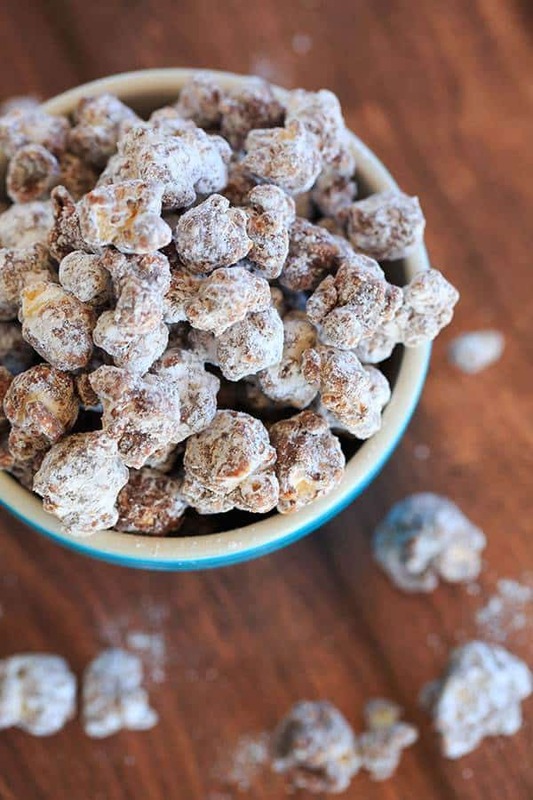 This popcorn version of the enormously popular muddy buddies (or “puppy chow”) is chocolate and peanut butter-covered popcorn tossed in powdered sugar. I first discovered the wonder of muddy buddies a few years ago and since then, I have only been able to make them around the holidays, or else I will eat the entire batch within a matter of days. 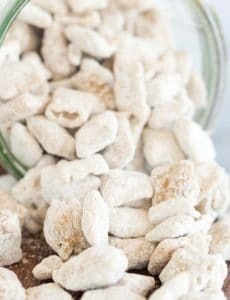 If you’ve never had them, muddy buddies (also sometimes called “puppy chow”) is chocolate and peanut butter-covered Rice Chex cereal that is tossed in powdered sugar. Basically, they’re the most addicting snack ever. This popcorn version simply replaces the cereal with popcorn, and I don’t think I even need to tell you how utterly fantastic of an idea that is. I’m currently hiding this from myself in the garage refrigerator until we have company because if it is easily accessible to me, I will absolutely eat all of it by Thursday. My mom bears the responsibility for getting me hooked on chocolate-covered popcorn. One Easter about 10 years ago, my mom gave me a basket with some of my favorite chocolates (peanut butter eggs and meltaways, naturally), but there was something new in there. There was a package of chocolate-covered popcorn from a local candy company. I had never had it before, and to be honest, wasn’t sure how I would like it (I know, crazy, right?). Then I tried it… and the rest is pretty much history. I thought it was one of the most genius combinations I had ever eaten. I typically use plain popcorn for this recipe, but last Friday, we went to the local orchard to buy pumpkins and I felt compelled to buy an enormous bag of kettle corn. 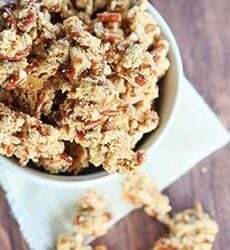 About half of the bag got repurposed for this recipe, and it was just as good as the plain popcorn. I also use large all-purpose bags from King Arthur Flour for coating the mixture in powdered sugar. I have found that it’s the easiest way to make sure that all of the pieces are evenly coated, but if you don’t have large enough bags, you can work in batches with a gallon-size resealable bag. 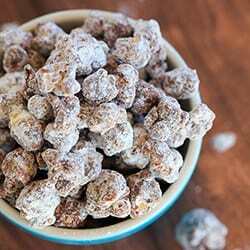 If you love all things sweet and salty, then this poppy chow was made for you. Grab some chocolate chips and peanut butter and get to it! 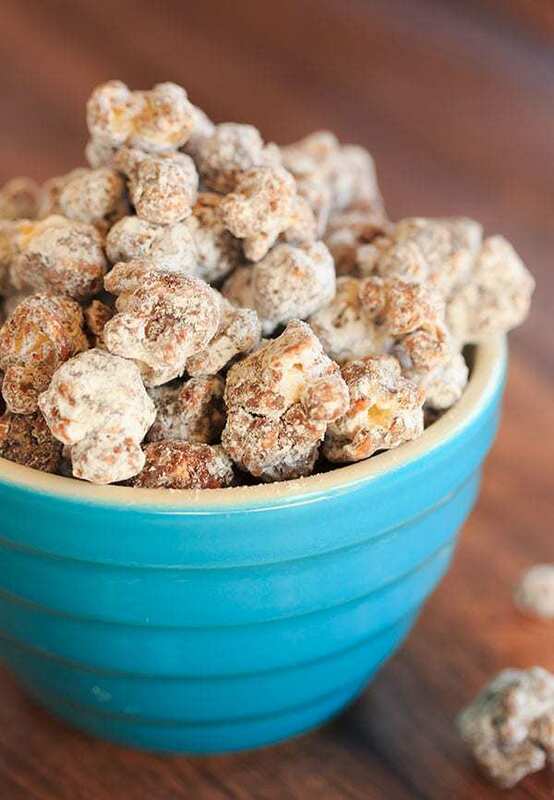 This popcorn version of the enormously popular muddy buddies (or "puppy chow") is chocolate and peanut butter-covered popcorn tossed in powdered sugar. Place the popcorn in a very large bowl; set aside. Add the chocolate chips, peanut butter and butter to a large bowl. Microwave on 50% power in 30-second increments, stirring after each, until completely melted. Stir in the vanilla extract. Immediately pour the chocolate mixture over the popcorn. 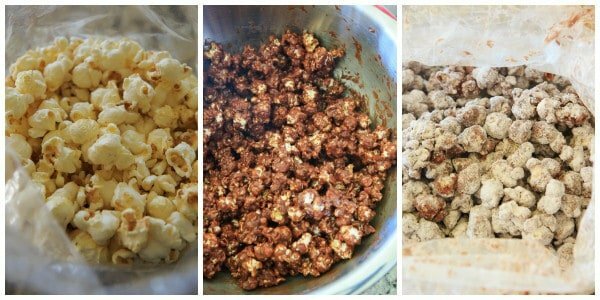 Using a large spoon, stir until all of the popcorn is evenly coated with the chocolate mixture. 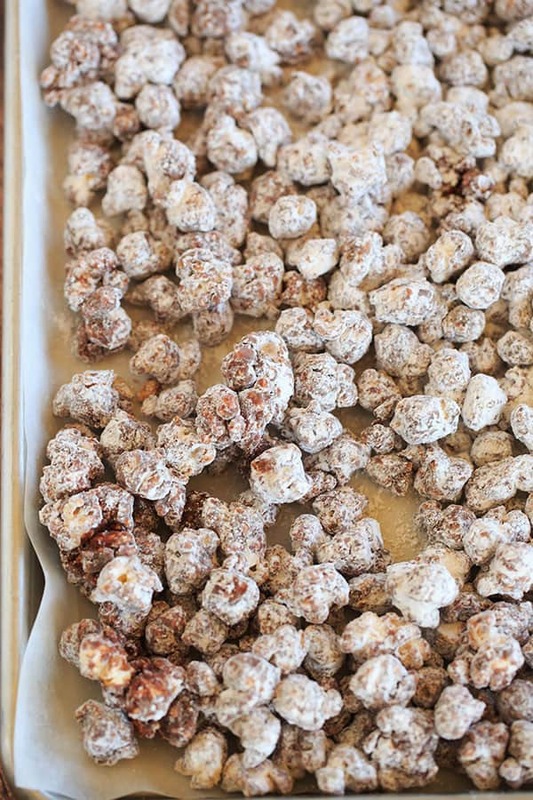 Place the powdered sugar in a large bag and add the chocolate-covered popcorn. Seal the bag and shake vigorously until all of the popcorn is coated in powdered sugar. (If you don't have a bag large enough, you can work in batches with a gallon-size resealable bag.) Spread the mixture out onto the baking sheet and refrigerate for at least 30 minutes, or until set. The popcorn should be stored in an airtight container in the refrigerator for up to 2 weeks. 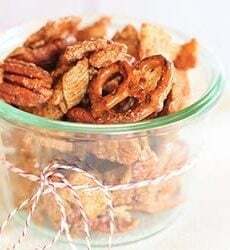 This recipe was originally published on February 24, 2011.